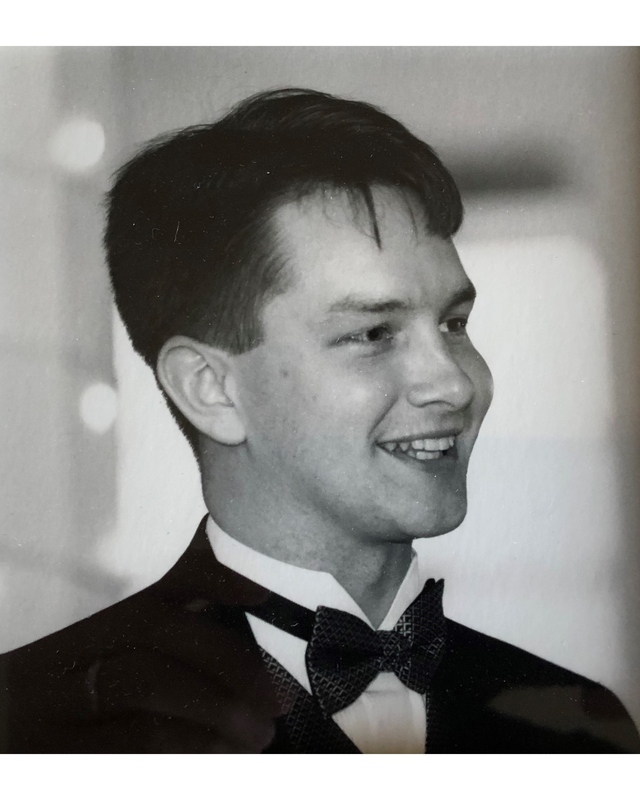 Bradford Alexander McCurdy passed away unexpectedly on November 14, 2018, following a sudden cardiovascular episode. Brad was a beloved husband, father, son, brother, uncle, cousin, nephew and friend to many. He will be greatly missed. Brad was born at The Presidio of San Francisco on August 2, 1971. He enjoyed a childhood filled with love and laughter and, as the son of an U.S. Army physician, was given the incredible gift of travel. Brad developed a special connection to Germany during his family’s tour in Frankfurt and always valued the rich culture he experienced while living there. After graduating in 1989 from Terra Linda High School, in San Rafael, Brad fulfilled his dream of studying architecture at Cal Poly, San Luis Obispo. He earned a spot in Cal Poly’s specialty architecture programs in both Copenhagen and Prague, graduating with his Bachelor of Architecture degree in 1995. In 2001, Brad married his true love, Shannon, and they settled down and started their beautiful family. For the past 21 years, Brad lived and worked in the South Bay and the Peninsula. In his free time, Brad enjoyed coaching his children’s baseball and soccer teams, volunteering for Rebuilding Together, Habitat for Humanity, Sacred Heart and Kiwanis. His true passions were spending time with his family and friends, going to San Jose Sharks games, and listening to music from his large collection. Brad was known for his love of electronic and alternative music, intellectual conversation and witty commentaries on current events. His brilliance always shined through, as he incorporated amazing amounts of trivia and knowledge into everyday chit-chat. He was that guy who would always say hello to a stranger and never thought twice about helping someone in need. Brad is survived by his loving wife, Shannon Alexander McCurdy, of Campbell; his children, Ian and Annika McCurdy, of Campbell; his father, Dr. James McCurdy of San Rafael; his sister, Laura Gregory (Ryan), of Napa; and numerous other relatives, including three nieces, one nephew, several aunts, uncles, cousins, and a large family of in-laws who loved him dearly. He was preceded in death by his mother, Gloria Jean McCurdy of San Rafael. A memorial service will be held Dec. 1, at 2 p.m., at Darling & Fischer, Chapel of the Hills, 615 N. Santa Cruz Ave., Los Gatos.